Once there is acceptance that the soul may be able to leave the body and travel to other places prior to physical death, the question arises: "Where can the spiritual traveler go on these inner journeys?" In spiritual travel, states of consciousness (the places the traveler may visit during spiritual travel) may best be understood using the metaphor of geography. We discuss the degrees of awareness associated with different states of consciousness on the page titled The Hierarchy of Dreams but on this page, we first subdivide the universe into a broad ontology or set of worlds. When the subject of spiritual geography is studied and debated, the goal is to produce an accurate map of consciousness. There are spiritual groups that develop these maps of the spiritual universe such as the Theosophical, Tibetan Buddhist, Sufi, and Indian Sant Mat Traditions. They do this in part to help their followers understand the world or plane from which a given experience originates by plotting its location on their cosmological map. It is probable that early Christians had such spiritual maps as is evident in the bible where Saint Paul mentions a man who was rapt up to the third heaven in 2nd Corinthians 12. A third heaven strongly implies a first and second heaven which differ in some way, and a map or hierarchy that describes the relationship of each heaven to the others. Many times, religious groups also develop such maps because they are interested in describing where the soul can go after death. In general, the author has not found these maps to be of much help in understanding my own out-of-body experience. Here, I suggest a relatively simple three level hierarchy of spiritual travel experience which I have found to be more useful. The basic areas the spiritual traveler may visit while outside the physical body are the physical world, the psychic worlds, and the spiritual worlds. The physical world is the easiest to explain since it appears much as it does when looked at from an everyday physical perspective. While people in an out-of-the-body state are not restrained by gravity, and cannot interact with physical objects because they are not embodied, many of the visual and auditory elements of the experience remain the same. A good description of a travel experience in the physical world is from the Sioux medicine man Black Elk who fell unconscious during breakfast one day and had the experience described on the page titled Black Elk's Description of Crossing Over the Atlantic . There are also a number of detailed descriptions of spiritual travel in the physical world in the Near-Death Experience section of this web site. More difficult to describe are the psychic worlds which are so varied that one can talk about them only in the most general terms. They consist of such abstract elements as imagery, sound, thought, memory, identity, emotion, and different degrees of limitation. On the near end of the psychic spectrum, there are areas that are all but identical with everyday experience in the physical world. On the far end, there are, for instance, radical alterations in personal identity involving immersion of the soul into powerful environments composed of raw emotion. The soul can also, for example, encounter exotic areas where it becomes aware of some of the collective memories of past civilizations. These psychic areas can also range from very positive, beautiful, and joyous to very negative and hellish. We can speak of dream environments as the most common and familiar examples of a psychic world. I call these areas psychic because thought has great power to build, mold, and change them. For instance, when the traveler enters dream environments in full consciousness, he or she discovers how plastic and malleable they can be on one hand and how real and physical they appear on the other. 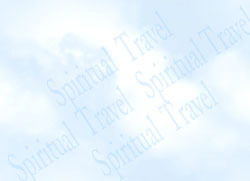 This site contains many examples of the psychic states encountered during spiritual travel. Even more difficult to describe are the spiritual worlds. These are the areas of mystical experience. The most accurate descriptions are the poetic ones that attempt to describe infinite joy, light, love, knowledge, bliss, or emptiness. Slightly below the mystical areas are the places where the mystical light is reflected and refracted. These are the paradises of jeweled skies, rivers of nectar, mountains of flowers, and similar kinds of organic and crystalline imagery. Here, there are also divine currents of music in celestial oceans of sound. The sections on Sacred Light and Sacred Sound describe the spiritual areas. These mystical states are the ultimate goal for the true spiritual traveler. Deities interact with the spiritual, psychic, and physical worlds in the process of creation. These deities with their vast awareness and various attributes exist in the spiritual worlds and are complex standing waves, eddies, or vortices on the surface of the limitless ocean of consciousness. They act individually but collectively create universes inhabited by diverse forms of life. The worlds of creation are like oceans. One deity's creative power affects the tides, another the shape of the ocean floor and the continents, another the winds, another the rivers that flow into the ocean, and another the ocean's currents. Each deity acts independently within his or her scope of creation but they are jointly responsible for the dynamics of the created worlds. The most distinctive creations of deities are their paradises which exist in the spiritual worlds or on the border between the spiritual and psychic worlds. Deities usually preside over their individual paradises and control access to them providing pathways that souls can travel to enter them after death. An example of such a paradise is provided on the Land of Bliss page to give a clearer view of these heavenly worlds to the reader. However some gods are exclusively creative in function and do not have paradises. The page on Brahma (the creator god in Hinduism) gives an example of such a god. This exclusivity in function explains why there are virtually no temples or devotees of Brahma in India in spite of his creative power. Since Brahma does not interact with human beings, he does not seek communication or worship, and therefore has no temples and no rituals associated with him. The universes are layered with different viscosities of light and form. The ocean of consciousness pours down through the various layers, and the deities who channel this light participate in varying degrees in the creation of the universes. Their light becomes intermingled in the vast waterfalls of light that burst through the divine universes on their way to create the world of matter. The spiritual areas of light and consciousness shower down into the psychic areas of flowing forms and ideas where thoughts and imagery can be turned into things shaped by the power of mind. This psychic flow, in turn, continues down the creative waterfall to manifest the physical world where things become more fixed instead of flowing as they do in the psychic worlds. The creation of the material substrate that might be described as the substance that powered the Big Bang evolved into the physical universe we see today. This event of creation occurred eons ago. However the way the world evolved is based on patterns and structures that are decided during the initial creative process. So the deities do not usually create worlds directly but instead create the material basis and the patterns and templates of change they will use as they evolve. The common element present in all these realms is not matter or form. It is consciousness which takes on cosmic and universal qualities in the spiritual realms, and individual and collective forms in the psychic worlds. Consciousness manifests itself as individual, sentient beings in the physical world. We sometimes see a universal approach to religion that uses geography to describe how the many high gods and great religions all ultimately lead to the same goal or spiritual reality. One geographical analogy is the mountaintop where each religion has a thin wedge of mountain real estate whose apex touches the mountaintop which is the goal of all religions. Each great religion provides a unique and narrow path up the mountain to the summit. This seems to be a misleading analogy because the summit (ultimate reality) is very small and the mountain (various gods and religious traditions) are collectively very large. Perhaps a better analogy is that each great religion has beach front real estate and ultimate reality is the vast and deep ocean. Each major religion and its god or divine ideal provides access to the ocean of consciousness or ultimate reality. Each religion has access to the ocean but the ocean front terrain (like religious culture) is varied and stretches from glacier to forest to fiord to desert to tropical beach. This analogy provides for the wide variations of religious culture and divine attributes but also shows that no matter how great and powerful the god, he or she is small when compared to the ocean of consciousness which is the ultimate source of divine power and of awareness itself.